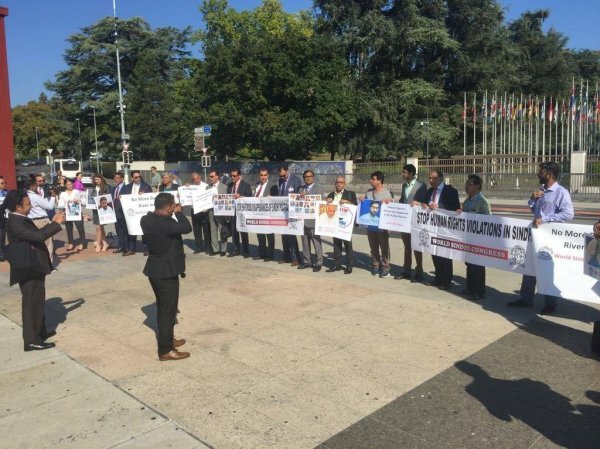 During the 39th session of the UN Human Rights Council (UNHRC), UNPO Member World Sindhi Congress organized a protest against Pakistan’s human rights violations in the Sindh region. They were joined by Baloch, Pashtun and Kashmir-based activists, whose people suffer similar abuses. Pakistan’s government is accused of enforced disappearances, extra-judicial killings and the persecution of religious minorities. The China-Pakistan Economic Corridor (CPEC) and its policies have also created economic and environmental issues. The World Sindhi Congress held a protest in front of the United Nations Human Rights Council (UNHRC) accusing Pakistan of violating human rights in the Sindh province. The protest held during the ongoing 39th session of UN Human Rights Council was joined by Baloch, Pashtun and activists from Pakistan occupied Kashmir. The Secretary-General of World Sindhi Congress Lakhu Luhana said that the Human Rights situation worsens every time with every issue. While talking to ANI, Luhana said that several issues including extra-judicial killing, enforced abduction and killing of religious minorities continue unabated. He called the dam construction a matter of life and death. "The Human Rights situation worsens every time. There are several issues including extra-judicial killing, enforced abduction and killing of religious minorities continue unabated. Now, CPEC continues and now they have decided to build dams without consultation of any legal, historical, international laws on River Indus, dams which have already destroyed Sindh," he said. Referring to the statement by Pakistan Supreme Court Justice where he said that anyone who opposes the dam construction is traitor, Luhana said, "They want to eradicate the Sindhi people from the face of the earth." The Sindhi Human Rights Activist, Naveed Basheer shed the light on the demands of the Sindhi community. He said that Sindhi are protesting against discrimination, mass hatred, water scarcity and enforced disappearance in the province. "Sindhis fighting for their rights are called Indian agents and are arrested. Everyone arrested is sent to military torture cells. People are kept there and several died." Calling it a phenomenon, Basheer said that the people are tortured in order to get them to confess to being Indian agents. "Nationalist movement in Sindh is getting stronger. They want to pressurize Sindhis," he asserted. Talking to ANI about the water crisis in the Sindh province, Basheer said, "They want to build dams in Sindh. All the dams are made on the Indus River. That region has an agricultural area as well as desert. Taking water from the river would cause a problem as we don't have water in downstream." The protesters also raised slogans against the multi-billion dollar China Pakistan Economic Corridor and demanded the Pakistan government to stop constructing dams in Sindh, Balochistan and Gilgit Baltistan.